Origin and Habitat: Garden origin (Nursery produced cultivar). Japan. Description: Astrophytum myriostigma cv. 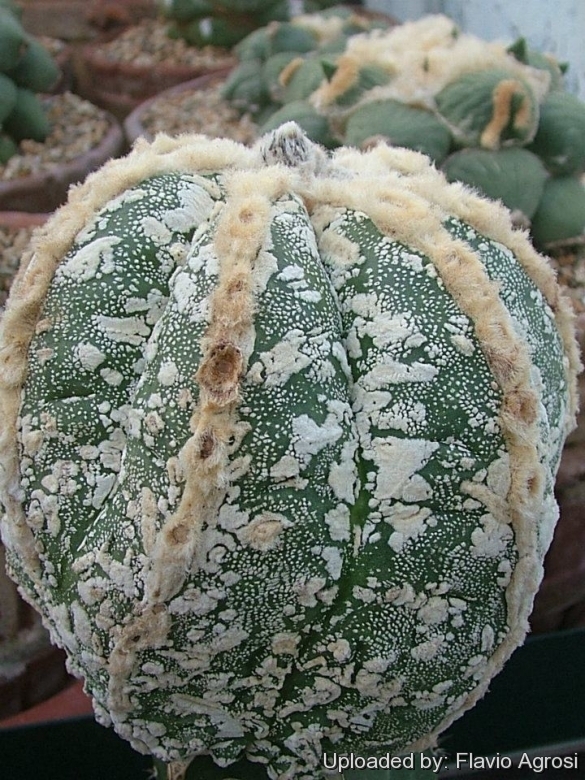 Hakujo Fukuryu is the result of crossbreeding between two of the most famous Japanes myriostigma cultivars Astrophytum myriostigma cv. Hakujo and Astrophytum myriostigma cv. Hakuun and shows some interesting intermediate features of both the parents. These hybrids have inherited by 'cv. Hakujo' the felty line between contiguous areoles so it seems like the areoles are connected with each other and by 'cv. hakuun' the white flecks that condense forming characteristic cloud-like patches.